Save 70% Today on BatteryBooster for BlackBerry | BlackBerry Blast! Boost your battery's current runtime! Benefits: Enhance the current battery runtime. Convenience: Can run in background: BlackBerry� can be used for other purposes as well. Plus TWO Applications included for Free! 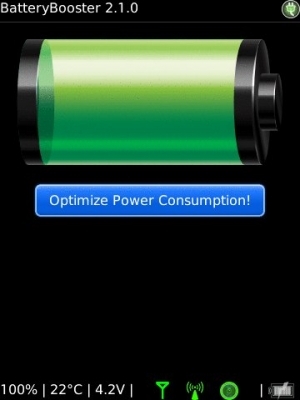 - PowerControl is a neat battery saving tool! It allows you to schedule your device to turn off and back on when you want. Multiple off/on schedules are possible and can save a lot of power! - SmartWiFi saves battery by turning off WiFi when not needed and turning back on when needed. For example, WiFi being switched on is not needed when you commute between office and home. When WiFi is off battery is saved. If you like BatteryBooster please write a review. Thanks. This product comes with a 30 days value back guarantee. More info on our website. Battery saving recommendations for BlackBerry� settings: best practice backlight timeout and brightness settings for battery preservation. Low signal radio saver: a BlackBerry� phone searches extensively for better network coverage when the radio reception is low, this wastes an tremendous amount of power and drains the battery very quickly. BatteryBooster can now switch off your radio if reception is too low.